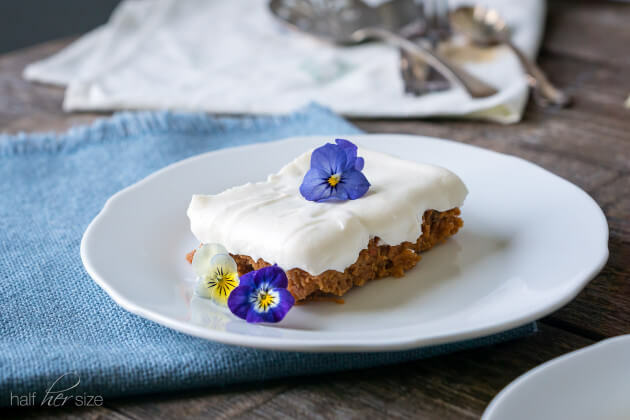 Super easy 3 ingredient carrot cake using a short-cut on a classic carrot cake recipe. Comes out super moist, so sweet, and right on the verge of ooey-gooey. Perfect for anyone looking for healthier dessert recipes. Easy, semi-homemade, carrot cake recipe for potlucks and parties. No one will guess this sweet and sticky cake has about 85 fewer calories than most classic recipes. The hands-on time is under 10 minutes! Inspired by the popularity of 3 Ingredient Lemon Cake I’m back with another take on the 3 ingredient cake. 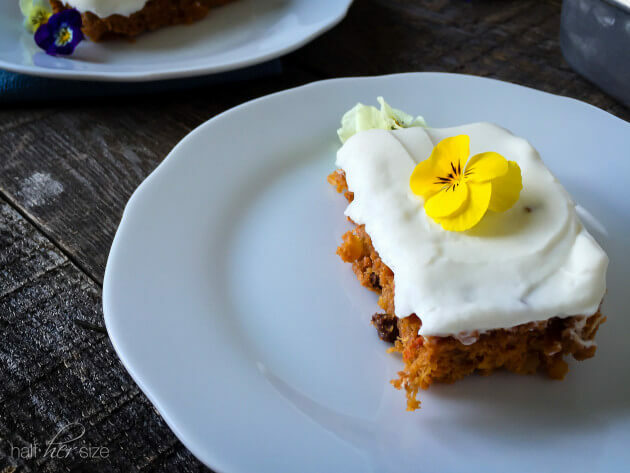 If you like carrot cake you are going to LOVE this, super easy to bake at home, lighter version! This healthier carrot cake comes out super moist, so sweet, and right on the verge of being ooey-gooey. If we were talking about chocolate I would call this fudgy and decadent. What the heck is “fudgy’s” non-chocolate equivalent? The 3 ingredient method couldn’t be easier! I have only tried this carrot cake recipe with the Duncan Hines Decadent Carrot Cake mix. I like that it comes with a separate pouch of dehydrated carrot shreds and raisins. You get to rehydrate the carrots before stirring them into the cake batter. The combination of carrot, raisins, and pineapple (the 3-ingredient secret weapon) give the cake the essential classic carrot cake texture. You do not need to finish this cake with anything, it’s delicious as is or with a quick dusting of powdered sugar. It would also be delightful with a dot of light whipped topping. 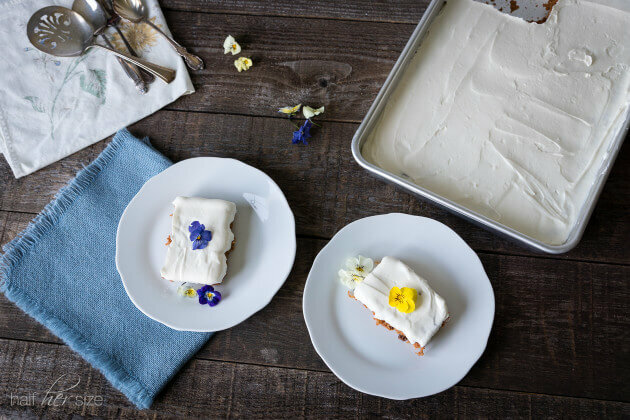 Give this cake the classic carrot cake finish with a light cream cheese frosting using Greek yogurt cream cheese. 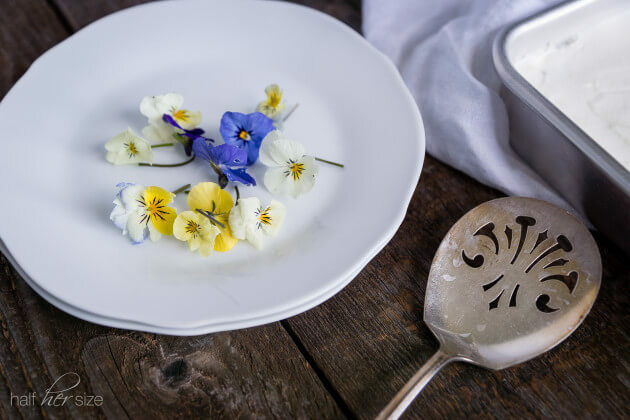 Light and tangy like cream cheese the Greek yogurt version has less fat and calories and more protein. Recipe: Lightened Cream cheese frosting. Pour the entire can of pineapple (fruit and juice) into a 4 cup mixing bowl. Add the contents of the carrot and raisin pouch, stir, and let sit for 5 minutes (or longer). Meanwhile, set your oven rack to the vertical center and preheat the oven to 350F. Coat the inside of a 13x9 cake pan with a thin, even, layer of butter or non-stick spray. Dust the inside of the pan with flour, tap the sides to cover the entire surface, shake out any excess flour. In a large mixing bowl add the contents dry cake batter pouch, the pineapple mixture, and the yogurt. Fold the ingredients together until they are fully combined with no pockets of dry mix. The batter will be very thick. Spread the batter in an even layer in the cake pan and bake for 35 minutes. When baked the center should be sticky but firm to the touch. Let the cake cool completely before decorating and serving. This cake is very moist and sticky. When serving use a sharp knife and wipe the blade clean between each cut. 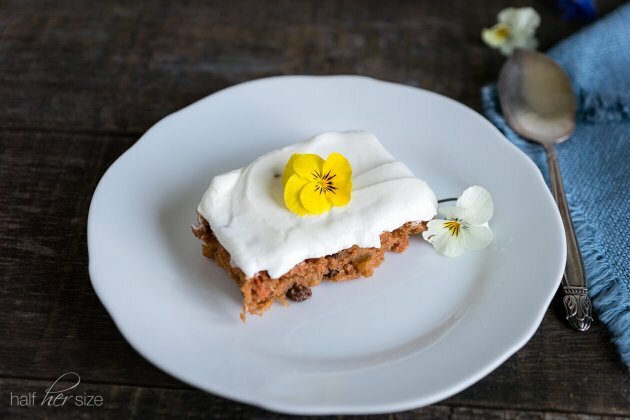 I will definitely be trying this recipe — my cousin’s family LOVES carrot cake and with this quick and easy recipe, I’ll be set the next time we all get together! And the flowers are so pretty! OMG only 3 ingredients? That’s amazing! Would be such a great dessert for Easter! Yep just 3 ingredients! It’s great for Easter, I’ve also served this for Mother’s Day, it’s always a hit. I wanted to make this cake for Easter and when I got to the store on Easter morning the mix was all gone, I guess everybody wants to make your recipe. I made the lemon cake instead and we loved it. Next year I will buy the carrot mix ahead of time.